Radio Zürisee is one of the biggest private radio stations in Switzerland (source: Wikipedia). The new website is in effect a digital companion to the broadcast content. With the new website, people can listen to live audio streams or podcasts, and enter competitions to win prizes. They can also find more information about music, events and advertisements. Finally, visitors can use the new web shop to buy merchandise and tickets. 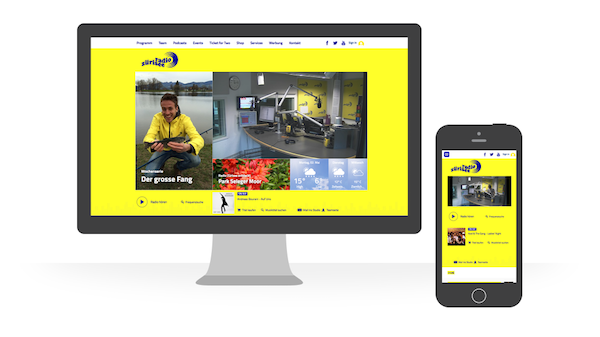 The new website is based on django CMS and it’s running on the Divio Cloud platform, allowing the station’s own IT department to be able to manage the website completely autonomously and with minimal effort. A product by Divio that provides the best production-ready and out-of-the-box solution for django CMS websites. Divio provided a standard and proven project configuration with sensible defaults, that also benefits from continuous improvement and development that can be applied as an automated update. The Divio Cloud platform took care of all the heavy lifting and optimisation around deployment: the client was able to focus instead on what makes the site’s applications, features and design. Celery background workers using RabbitMQ as backend - amongst other functionality, this is used to download/upload podcasts and to update the currently-playing track in the background.